despite all of the darkness." 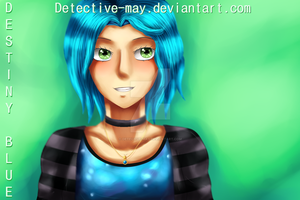 DestinyBlue is a very famous artist on DeviantArt which I admire.Her artworks are extraordinary and so beautiful and every each has its own message.Sadly,I found that she is having problems with mental health the recent months but I`m glad that she`s getting better now and I decided to make something little. We love you,DestinyBlue!Be strong and never give up! Oh my goodness,she saw it!She knows I exist!! !Sorry,just give me a second to take a breath. Anyway,I'm glad you like it! And that you managed to find some time for it.I thought it was one in a million since you're busy with traveling and all that and you have so many followers who probably send thousands of things.